Available in WHSmith, supermarkets and newsagents. A new guide to the best breweries in the world and the stories behind them and their beers. – In-depth features on 100 breweries from the UK, US, Belgium, Germany, the Czech Republic, Italy, Ireland, Scandinavia, Australasia and more! – Features on the brewing process and brewing equipment, brewing history, abandoned breweries, and some general beer appreciation and consumer-focused helpful info. If the first issue of ‘Craft Beer’ – the 365 Best Beers in the World – was a mixtape of the best of the modern beer scene, this second issue is something slightly more thoughtful and complex. Perhaps a ‘background to cooking breakfast’ Radio 4 program about a particular genre of music, exploring the inspirations, variety and depth of the scene. When Craig and I were asked to write a follow-up to the 365 Best Beers in the World, covering the world’s best breweries seemed like a good next step. The content was always going to be far more than just a list, and as we fed more and more ideas into the outline, it became quite clear we would need some reinforcements. Leigh Linley, Matthew Curtis and Ruari O’Toole are great writers and good friends of ours. Craig and I were both certain that they had the determination and boundless enthusiasm to get the job done. By dividing our labours, we could each add our own expertise and passions to different areas of the project. Splitting the UK breweries between the five of us, Craig, Matt, Ruari and myself each took on one of the other major brewing countries (I chose Belgium, Craig takes on the Czech Republic, Ruari covers Germany and Matt covers the US) and a couple of features each. Another key decision early on was to try to get as many in-depth interviews with brewers as we could. Our interviews show that, like the breweries themselves and the beers they make, brewers simply do not fall into one particular category or type of person. At the European Beer Bloggers Conference last year, Garret Oliver said in his keynote speech that ‘Beer is People’, and I think this is a good introductory idea to what the new magazine is all about. At the heart of this amazing industry are some amazing people, and this magazine tells the story of some of the best of them. I hope people enjoy the new issue as much as the last one. I can’t wait to read it myself. I worked with some fantastic writers on this magazine and I’m really looking forward to reading their work. Cheers! ‘ Craft Beer: 100 Best Breweries in the World’ is available to order online, and should be on the shelves of a WHSmith, supermarket or newsagents near you. I’ll add a link to this post for the iTunes version shortly (and subscribers to the last magazine through iTunes may already have early access). 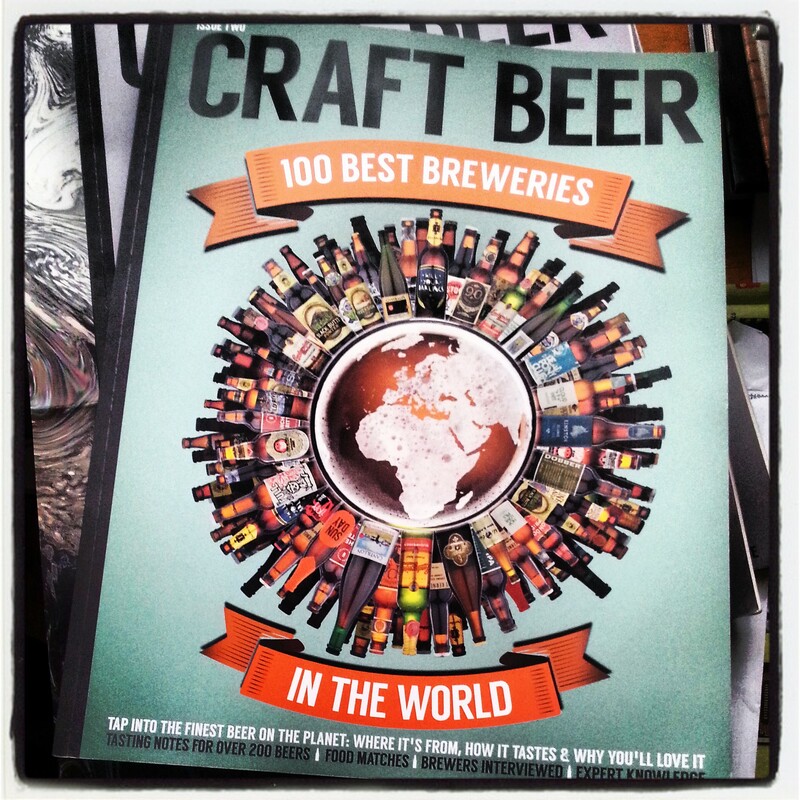 100 Best Breweries in the World – Quite an undertaking here and I look forward to getting my hands on a copy. Volume 1 was fantastic, if you’re interested in learning about breweries far and wide this would make a very good buy. Available in Eason in Ireland, I picked up a copy yesterday! Oh! This looks like something I must have! Just one. Sadly, we only had room for a few Antipodeans – Little Creatures, Epic and 8 Wired – but would have liked to have been able to include more. 100 is a surprisingly limiting number when you want to include X number of US, Belgian, German and UK! Cool I understand, maybe you could do 1000? Which is the Australian brewery? Little Creatures. As I remember, it was a call between either them or Stone & Wood, who are also excellent.